‘Hartston’s story about Botvinnik-Bronstein had appeared in one of my columns. 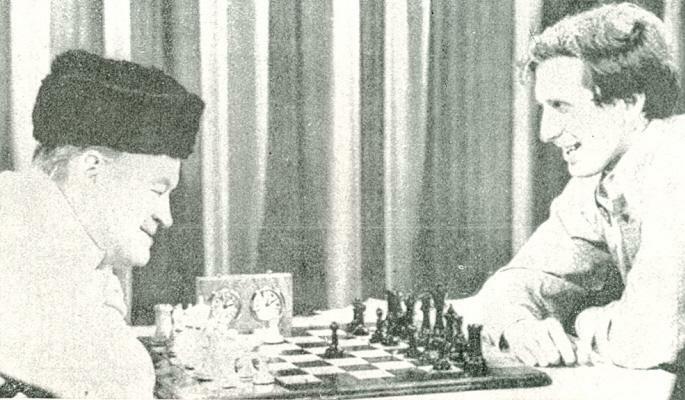 My own source was the Pakistani A. Kitchlew, a strong player who competed in the Hastings Challengers’ tournament in the 1950s and 1960s and a few years ago won a lower section at Jersey when in his eighties. Kitchlew and I both played for the Linguists Club of Kensington, London, team in the National Club Championship around 1956, and he then told me that he knew Sultan Khan and that Sultan had indeed made the comment I quoted. I had and have no reason to believe he was embellishing the tale. 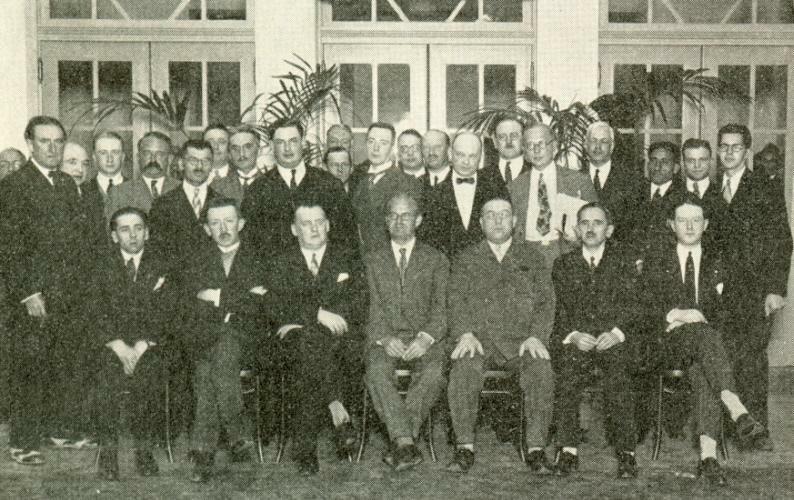 Sultan Khan is standing third from the right in this group photograph taken at Liège, 1930 (American Chess Bulletin, September-October 1930, page 140). A challenge to readers is to provide a complete caption/key. ‘For years there has been a division of camps between chess Players and Problemists. The two classes apparently had nothing in common. 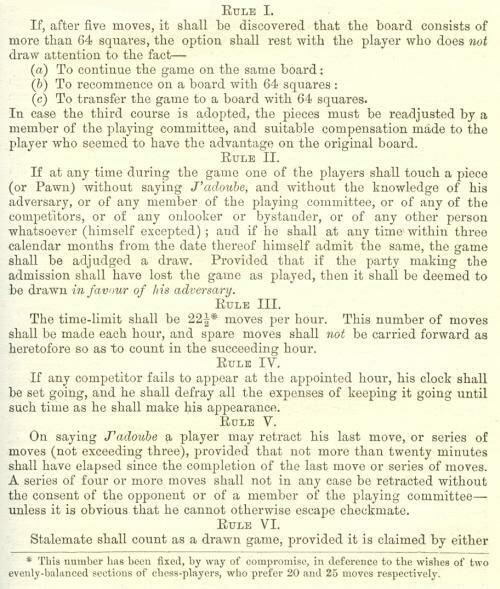 The player would look upon problems as sheer waste of time, exhibiting positions that were practically impossible of occurrence over the board. On the other hand the problemist found the game too dry, uninspiring, lacking in that wit and polished stratagem to be found in his clever creations. Personally, I was brought up in both camps. I learned most of my chess under the tutelage of a clique of problem composers, of whom Maxwell Bukofzer of Long Island was the leader. ... I sent [H.L. 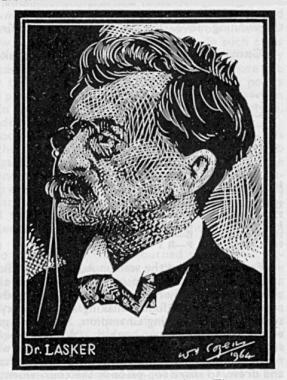 Dolde, who ‘was running a wonderful column in the Pittsburgh Post’] some of my efforts, and what a thrill when the first one was published. It was all very absorbing, and I could hardly understand the attitude of the players, who would sneer when they passed the table at which our problem coterie was gathered, and sit down to play their “useful” games. Jan Kalendovský (Brno, Czech Republic) draws attention to a webpage giving details of films in which Richard Réti’s wife appeared. 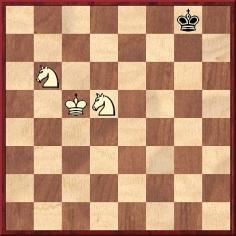 “The following position arose after White’s 77th move and, despite the fact that the assistance of both seconds was required to convince Kotov and only after the latter had greatly upset his opponent claiming that a method had recently been found in the Soviet Union for winning this ending, there was no changing the outcome: an irrevocable draw. 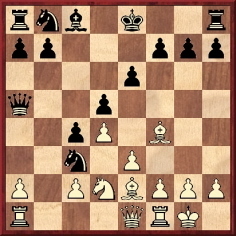 The diagram is labelled “Kotov-Najdorf Zurich 1953”. This section of Donner’s volume is described as a “fragment of an endgame book” (page 229), and on page 244 the source is given as “M. Euwe & J.H. Donner, Het Eindspel 1 Utrecht 1977)”. 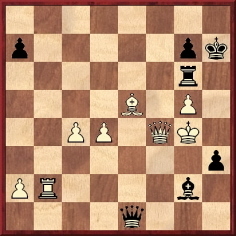 How did the improbable story arise that the game continued until move 77? 1 f4 e5 2 g3 exf4 3 gxf4 Qh4 mate. Source: column by Herman Steiner, Los Angeles Times, 8 August 1945, page A7. Our correspondent suggests that her forename was probably Angeliga rather than Angeligi. We are seeking earlier uses of the word in a chess context, as well as clarification as to whether the singular form should be isolanus (Latin) or isolano (Italian). Michael McDowell (Westcliff-on-sea, England) proposes a discussion of J.G. Campbell, and the present item makes a start with some quotes about him. These quotes come from the chapter on ‘James [sic – Joseph] G. Campbell’ (1830-1891) on pages 65-68 of The Knights and Kings of Chess by G.A. 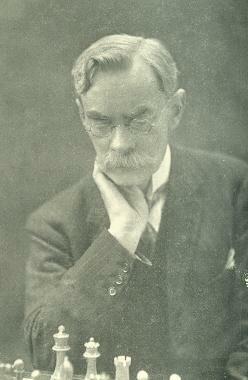 MacDonnell (London, 1894). MacDonnell being a relentlessly fizzy writer, it is worth comparing his remarks with chess magazines’ comments about Campbell following his death. 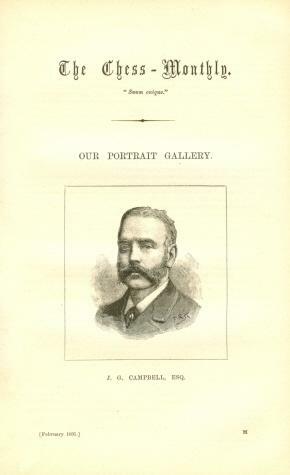 The obituary on page 67 of the February 1891 BCM stated that Campbell had died on 1 January, of pleurisy. He was ‘an excellent problemist, but he was also a remarkable strong natural player, and took high rank in the list of Metropolitan amateurs’. The two Anderssen games were mentioned (being dated 1860 by the BCM and recorded as one win apiece), and Campbell ‘was the winner of set matches against Barnes, Falkbeer and Wormald’. He ‘also encountered Messrs. Brien, Harrwitz, Horwitz, Zytogorski, and other leading players of those days, and bravely held his own against them’. 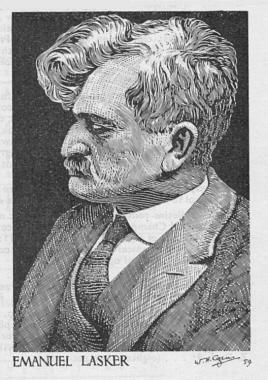 There is a small discrepancy regarding Campbell’s date of death (1 or 2 January – the obituary on page 162 of the February 1891 Chess Monthly gave the latter). 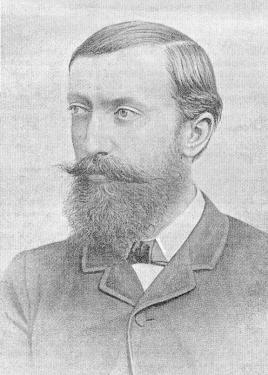 That article reported that Josef Kling ‘soon detected Campbell’s exceptional aptitude for the game’ and that Campbell played two games (a win and a draw) against Anderssen at Löwenthal’s house. 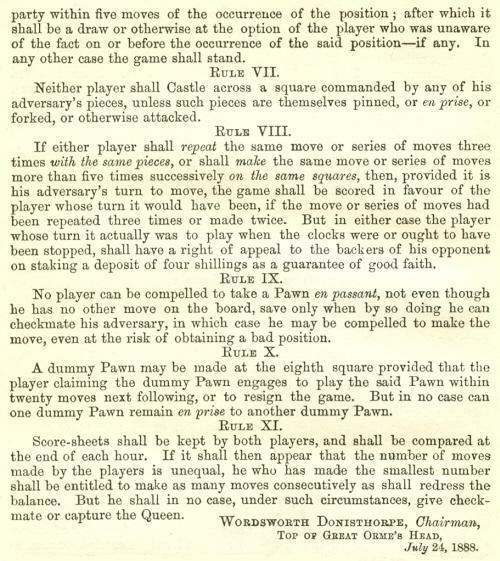 As regards the year of that meeting, it seems that both MacDonnell (‘1862’) and the BCM (‘1860’) were incorrect and that the Chess Monthly (February 1891, page 184) was right to put ‘1861’. Anderssen visited London that year, and Campbell’s win was given on pages 261-262 of the 1861 Chess Player’s Chronicle. 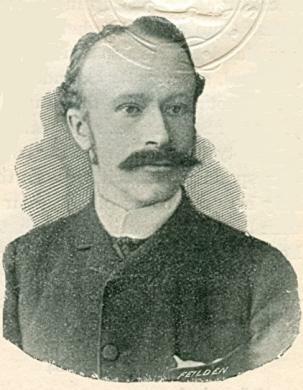 The Chess Monthly (page 162) also described Campbell as ‘one of the best problem composers of his time’, and reproduced the comments of Frank Healey, who referred to Campbell’s ‘genius as a composer of rare depth and originality’ and ‘his talent as a player with the well-merited reputation of being second to none of his contemporaries’. Browsing through the Chronicle of the late 1850s and early 1860s, Campbell’s peak years, we came across no particularly striking games by him, but readers are invited to expand upon the above jottings. 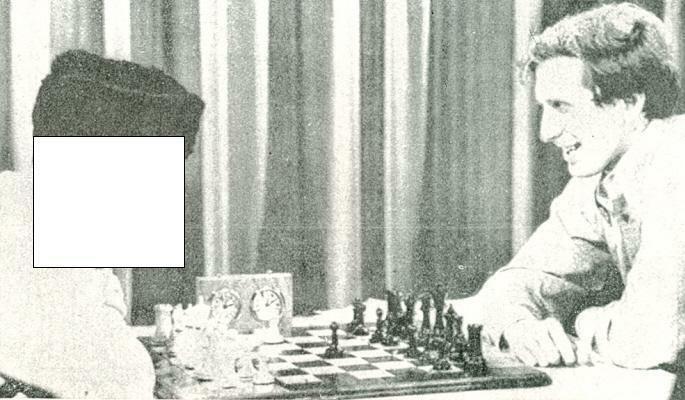 Page 177: in a reference to Tal and Fischer it is stated that Tal (born in 1936) was ‘the elder by ten years’. 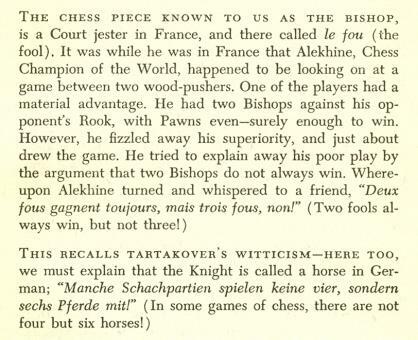 Fischer was born in 1943, and page 202 is therefore accurate in saying that at the 1962 Interzonal tournament in Stockholm he was aged 18. Whether this contradictory information is evidence that the Horowitz book had more than one author is an open question. Usage of the notation was never altogether standardized, and a discussion of the variants on pages 82-83 of the February 1892 BCM included a contribution from Forsyth himself. These sketches by Chr. 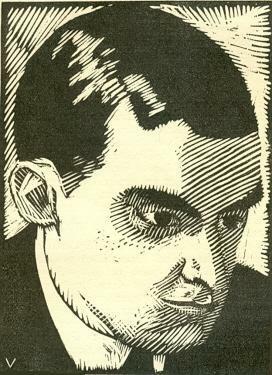 Brunschweiler appeared in the Berne, 1932 tournament book. What more is known about the item, including its present whereabouts? 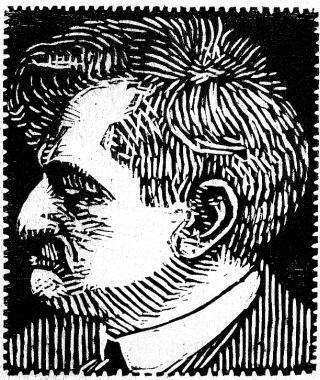 This illustration is of Luis Palau (1896-1971) and comes from page 44 of Schachkämpfer by Erwin Voellmy (Basle, 1927). In short, Sämisch could have won a clear rook with 43 Bg8+. 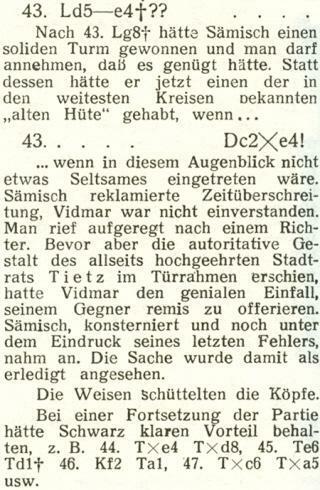 After 43...Qxe4 he claimed that Vidmar had overstepped the time-limit, but the latter disagreed. Before the controller arrived, Vidmar offered a draw, which Sämisch accepted. Brinckmann noted that after 44 Rxe4 Rxd8 45 Re6 Rd1+ 46 Kf2 Ra1 47 Rxc6 Rxa5 Black would have had a clear advantage. ‘R.P. Michell (1873-1938), who died 50 years ago this May, is ranked in Harry Golombek’s Encyclopedia as “a British Master”, and this estimate seems to have been agreed by everyone except Michell himself. “Had my chess activities been less restrained”, he wrote in 1922, “I might have become half a class better than at present – might, in fact, have become a Minor Master. 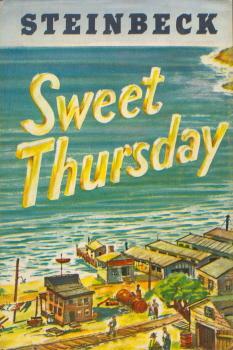 Prodigious.” On his coming first in the Brighton Congress in 1904, over F.J. Lee, P.S. 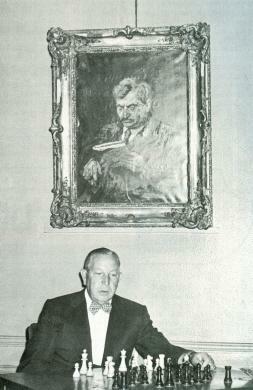 Leonhardt, and “Mr G.A. Thomas” as he then was, the BCM invited him to write as a new “celebrity” and send his photograph for reproduction. He replied: “I think the article will occupy quite space enough, considering that after all it only deals with an amateur player and not with one of the important masters.” And when at the great London Tournament of 1922 Michell won the Major Open, which included several masters, W.H. Watts in compiling Chess Pie had the greatest difficulty in getting a specimen game out of him – there wasn’t one good enough. In one sense Michell’s estimate of himself was right. A civil servant at the Admiralty, he never let chess get on top of his work. He hardly ever played abroad, but was rather to be found competing in the formidable City of London Championship, and taking his holidays to fit in with the British Championship itself – though he was second several times and frequently in the first four, the immovable H.E. Atkins always stood, or rather towered, in his way. His greatest pride (though he played in eight Anglo-American Cable Matches with a level score) was his West London top-board record over 16 years – 93 wins, 59 draws, 22 losses. 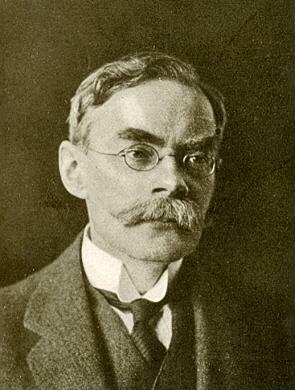 As his career spanned 43 years (1895-1938) he encountered a vast panorama of opponents, ranging from the Reverend John Owen in 1895 (1-0) to such “glorious remnants” from the ’30s still remaining as “H.G.” and W. Ritson Morry, whom he met in his final Championship appearance in 1937. 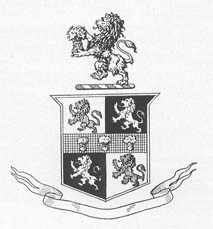 In between dawn and sunset, and divided by the 1914-18 War, came the Edwardian decade when his customary competitors included Atkins, Blackburne, Blake, Palmer, Shoosmith and Ward, and the post-war period when they faded away in favour of the emerging Goldstein, Gurnhill, Wheatcroft and Thomas (A.R.B.). Though frequently a prize-winner, Michell seldom “electrified” the Press or the gallery. Steadiness was his strong point – his efforts were usually summarized as follows: “played soundly and consistently throughout”, “no fireworks, but made few mistakes”, “does not skittle, but aims at accurate play even in offhand games”, “takes losses with his usual composure”. Only one incident seems ever to have disturbed his courteous equanimity. At Marienbad, 1925 there was “a crowd round the adjourned game he has just quitted. Comments and suggestions to his opponent are being freely expressed, till Michell, striding quickly to the centre of the group, with a single movement of the hand sweeps all the pieces off the board. The group breaks up, and his opponent flushes at the unspoken criticism” (BCM, July 1925, pages 295-296). Another instance of his strong principles occurred at Hastings, 1934-1935, when in the final round he partially marred the “finest hour” of his friend and frequent opponent Sir George Thomas, who stood ahead of everyone else. 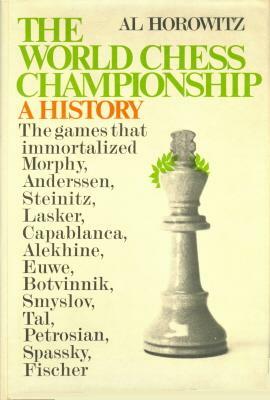 And “everyone else” included Capablanca, Lilienthal, Botvinnik, Euwe and Flohr – yet only Euwe could overtake him if he lost. But Michell, though himself quite out of the running, refused to “go easy”, played for a win, and got it, depriving Sir George of a clear “first” in a magnificent “field”. At the prize-giving Flohr “expressed a wonder whether any other country could have furnished such an example”. Although at Marienbad, 1925 when, aged 52, he was (in his own words) “overweighted” by Nimzowitsch, Rubinstein, Réti, Tartakower and Spielmann, ending bottom but one, he did better against foreign masters when they came to Britain, his best being Margate, 1923, where he was equal second with Bogoljubow, Alekhine and Muffang. 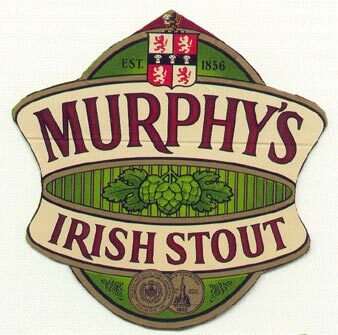 His win in 53 moves against the first-named was called by du Mont “a game for the connoisseur”. 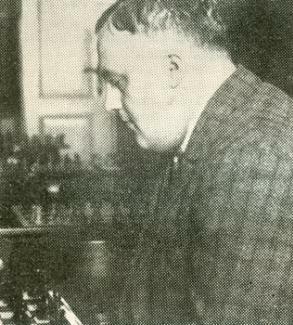 At Hastings, 1925-26 he was third to Alekhine and Vidmar, but in the following year (for the steadiest player can never avoid one disastrous tournament if he perseveres) he lost eight games off the reel with a score of one. However, in 1930-31 he was fourth, drawing with Capablanca in 38 moves, and in 1932-33 fifth, beating Sultan Khan and drawing with Flohr. But after reaching 60 his scores began to decline. 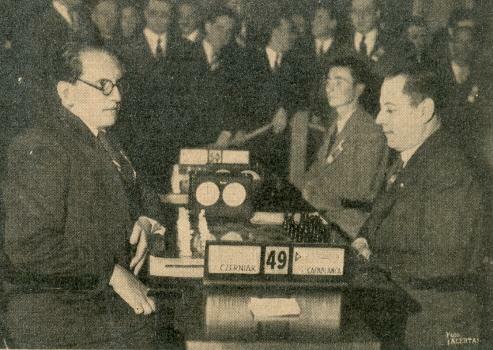 The 1936-37 Tournament saw an exceptionally strong foreign entry, including Alekhine, Fine, Eliskases and Vidmar. 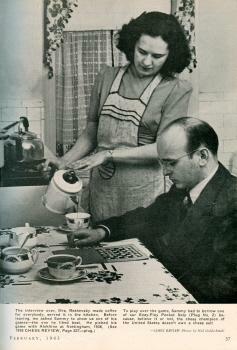 To give younger Britons a chance, Michell “cordially placed himself in the hands of the organizers for classification”. So his last two Hastings appearances were in the Premier Reserves – third in 1936-37 and ninth in 1937-38. Clearly his health was deteriorating – and a month later he contracted neuritis and never recovered. During his last illness his wife (herself twice British Ladies’ Champion) had to read to him all the available chess news right up to the end. An ultra-familiar chess quote is ‘When I am White I win because I am White. When I am Black I win because I am Bogoljubow.’ Wanted: early sightings of the phrase (e.g. during the master’s lifetime). Readers are invited to identify the person with whom Fischer is, to borrow a mouldy expression favoured by captionists, ‘sharing a joke’. C.N. 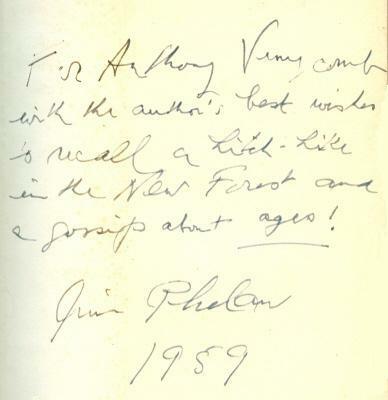 1730 referred to an article by John Colapinto about Jeff Sarwer (‘All the Right Moves’) on pages 50-58 of Saturday Night, May 1988, and we also have Colapinto’s subsequent article on Sarwer (‘Point Zero’) on pages 210-217 and 266 of Vanity Fair, November 1989. Now Amatzia Avni (Givaat-Shmuel, Israel) draws attention to Sarwer’s own webpage, which provides details regarding his two games against Josh Waitzkin. 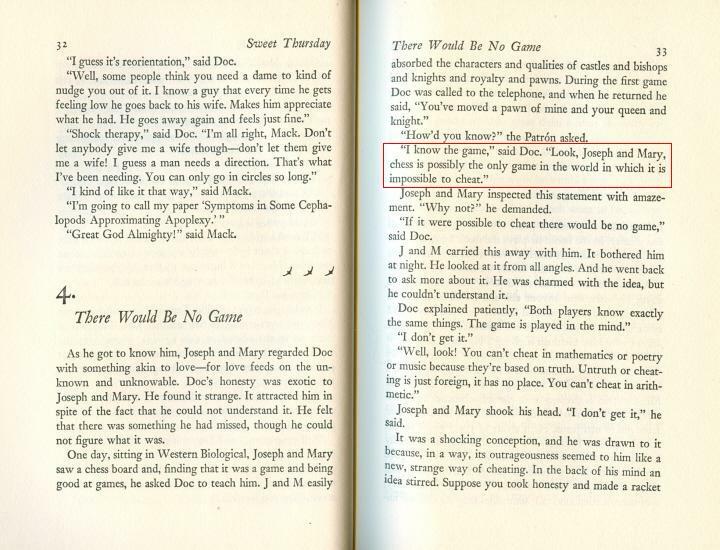 He presents a very different account from the one in Searching for Bobby Fischer by Fred Waitzkin (New York, 1988). Left to right, seated: 1. E. Colle, 2. N.N., 3. A. Alekhine, 4. A. Nimzowitsch, 5. 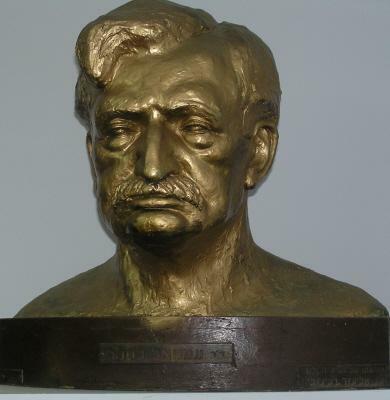 A. Rubinstein, 6. 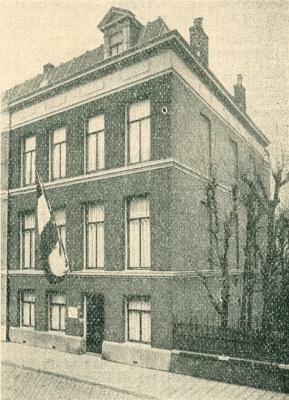 C. Ahues, 7. I. Pleci. 19. 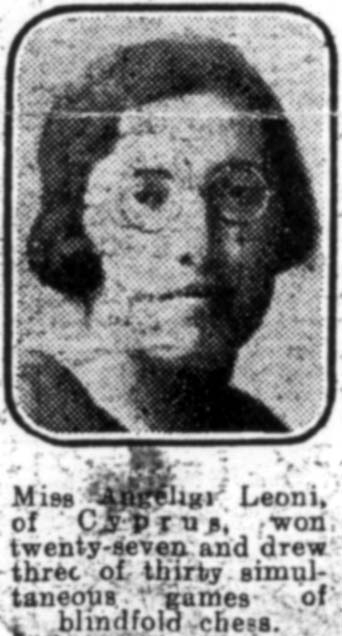 H. Weenink, 20. N.N., 21. N.N., 22. S. Tartakower, 23. N.N., 24. 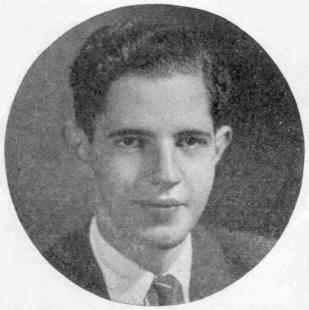 H. Kmoch, 25. Sir George Thomas, 26. Sultan Khan, 27. N.N., 28. I. Kashdan. 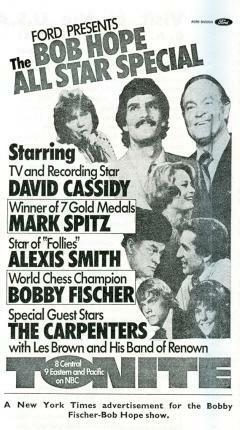 A recording of Fischer’s performance is commercially available. 5073. What did Alekhine write? 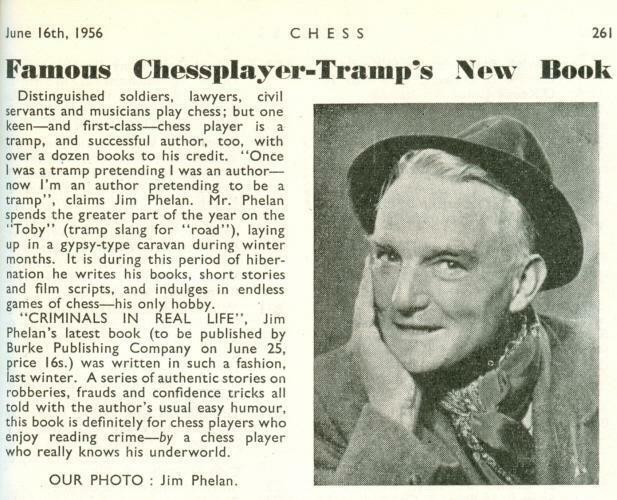 The above is a news item on page 129 of CHESS, June 1942. 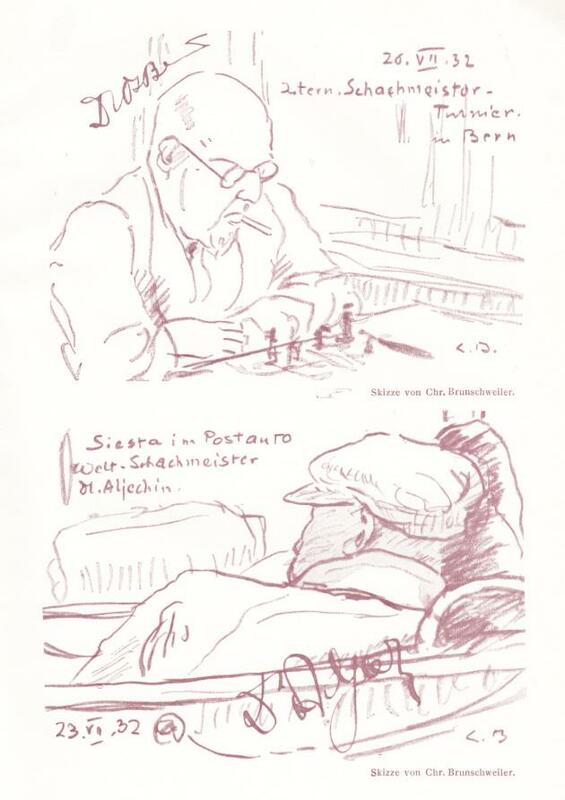 Can a reader identify the ‘new Spanish chess magazine’ and what did Alekhine write there? The periodical Estrategia ran for six issues, from March to August 1942. The chess pages were conducted by Miguel Czerniak and the bridge section by Adolfo A. Gabarret. The April number had an obituary of Capablanca, and on pages 36-38 Czerniak annotated his loss to the Cuban at the Buenos Aires Olympiad, 1939 (see C.N. 4143). Having awarded Capablanca’s 13 b4 two exclamation marks, he stated that he considered his reply (13...Bxb4) for nearly an hour, before becoming convinced that Capablanca’s combination was incorrect (‘how optimistic I was!’). In a later note he acknowledged that in accepting the sacrifice he had overlooked that at move 20 he would be unable to capture the white knight en prise at d4. 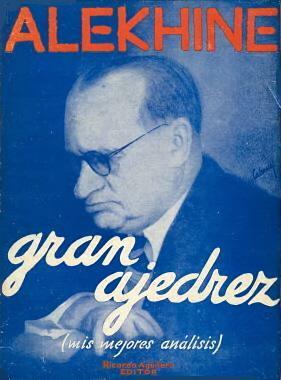 Annotating the game on pages 135-138 of his posthumous book Gran Ajedrez (Madrid, 1947) Alekhine stated that the line from 13 b4 onwards was ‘a very rare instance in modern chess of a master having to calculate so far ahead’. Is ‘George Hatfeild Dingley Gossip’ correct? That has been the customary spelling of chess writers ever since publication of the Oxford Companion to Chess in 1984, but what were the Companion’s grounds for switching from the previously used ‘Hatfield’? While recently processing our feature article on Gossip we felt uneasy, as on some earlier occasions, about ‘Hatfeild’, and not least because part of his education took place in Hatfield, Yorkshire. 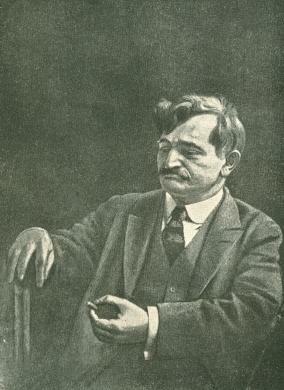 Joseph Platz discussed Lasker’s death on page 40 of his book Chess Memoirs (Coraopolis, 1979), referring to Hannak’s volume but not mentioning Fine. ‘The result of this encounter was wholly contrary to general expectations, inasmuch as Whitaker, who had played really brilliant chess in the early stages of the game on Tuesday, was considered to have at least a draw in the adjourned position, with a chance of winning. After resumption of play yesterday, however, he played quite indifferently, though the position was an exceedingly difficult one to handle. He was eager to establish an advantage, and this led him to neglect providing a proper defense for his king. 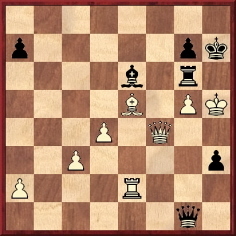 Capablanca had sealed his 51st move, and this proved to be B-Q4. At his 56th turn he studied for 20 minutes, an indication that he, too, found the position one worthy of careful study. Finally, he appeared to have made up his mind, and placed his queen at QB6 without, however, relinquishing his hold upon the piece. Suddenly he switched away from that square and played the queen back to KKt8. 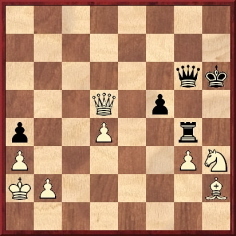 Whether this manoeuvre served to distract his opponent in any way did not appear, but Whitaker nevertheless made a move which enabled the Cuban to win an important pawn through a check by discovery. This was inexplicable to the bystanders, who accepted it as a case of nervousness. Later, Capablanca won the other of Whitaker’s centre pawns and then, getting out his rook, which had been bottled up for a long time, the Cuban soon had the game well in hand. 56...Qg1 57 d5 Bxd5+ 58 Qg3 Be6+ 59 Kf3 Qf1+ 60 Ke3 Qxc4 61 Bd4 Qc1+ 62 Rd2 Bf5 63 Qh4+ Kg8 64 Be5 Re6 65 Qd4 h2 66 Qd8+ Kh7 67 White resigns. 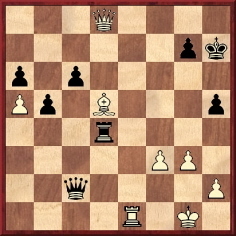 The American Chess Bulletin gave Black’s 62nd move as B-B4, but instead of Bf5 some sources (e.g. 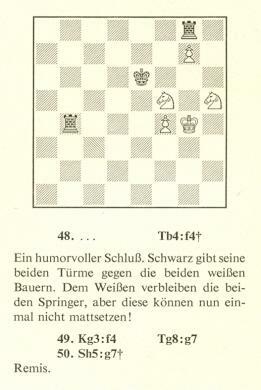 the Weltgeschichte des Schachs volume on Capablanca) have put Bc4, a move that would leave the pawn at h3 undefended. 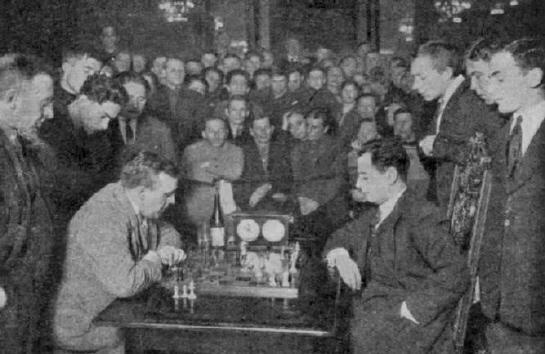 ‘... Capablanca met the united forces of the Bolshevik Commissars in a chess battle. 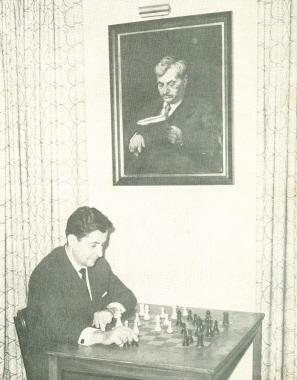 In the apartment of Attorney General Krylenko, who also is President of the Russian Chess Club, the world champion played 17 games simultaneously with the Commissars and Under Secretaries, winning all. After the exhibition Capablanca told the New York Times correspondent he did not have much difficulty, but agreed that first-class chess demanded more time than the majority of Soviet Commissars are able to give it. He said he regretted the absence of Trotsky, who is said to be a player of high quality. President Rykof of the Commissar’s Council did not play, but followed the games with keen interest. Another notable absentee was Tchitcherin, whose favorite pastime, however, is music. He is now playing his own chess game on a bigger board in Western Europe. Miquel Artigas (Sabadell, Spain) reports that the article in question by Alekhine appeared in Ajedrez Español, January and February 1942 (pages 6-7 and 32-33). It turns out to be the report on Munich, 1941 which we translated in C.N. 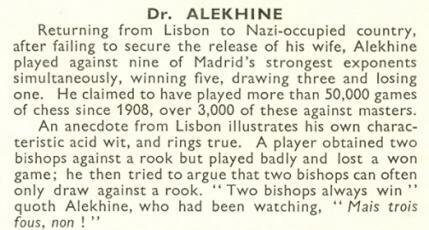 1233 from pages 187-189 of Alekhine’s book !Legado! (see pages 314-316 of Chess Facts and Fables). The full text is now available as a feature article. John Hilbert (Amherst, NY, USA) enquires about a matter discussed on pages 195-197 of our book on Capablanca: Lasker’s allegation that owing to a defective clock he lost 20 minutes during his defeat at the hands of the Cuban at New York on 5 April 1924. 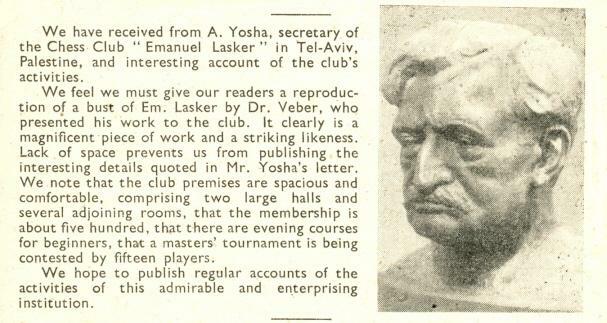 We quoted from De Telegraaf of 3 January 1927 Lasker’s strong attack on the tournament organizers in explanation of his refusal to participate in New York, 1927. Our correspondent asks whether the 1924 clock dispute was public knowledge before Lasker’s article appeared nearly three years later. Jon Crumiller (Princeton, NJ, USA) informs us that he possesses a chess board signed by many participants in the Buenos Aires, 1939 Olympiad, including Alekhine, Capablanca and Keres. It will be noted that our correspondent (who is a chess collector, and not a dealer) presents a number of other attractive items on his webpages. Is it conceivable that a German sentence such as the one in a) above was misinterpreted as the accusative singular, with the result that Isolani came to be regarded as a singular noun? A more general question still outstanding, of course, is why an Italian word was used. 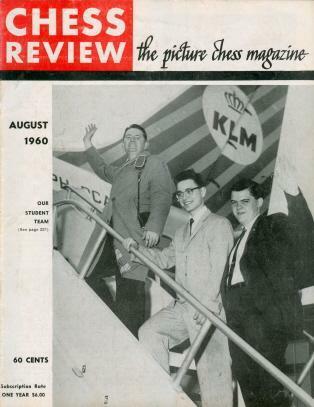 Jan Kalendovský (Brno, Czech Republic) draws attention to an Amsterdam website whose picture archives include many chess photographs. 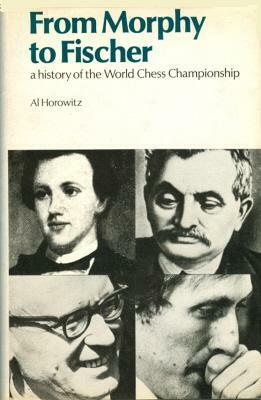 Some particularly interesting ones can be found by searching for the names Aljechin, Capablanca and Euwe.